Star Wars fans love stuff that made short appearances in the films. I remember as a kid how much I enjoyed my Empire Strikes Back AT-ST walker and the adventures my figures went on in the Twin Pod Cloud Car. I also remember my cousin's Darth Vader's TIE Fighter. I couldn't have one because I already had a TIE Fighter. Vader's TIE wasn't as much background as those other 2 examples, but it wasn't a major ship in the movie. It had a few minutes of screen time in a New Hope and then basically never appeared in a film again. It served as the template for the TIE Bomber, but that was hardly the same ship. This was Vader's ship. It wasn't a standard TIE, and what kind of havoc could the Dark Lord of the Sith wreak in it? Last season on Rebels, we saw Darth Vader destroy pretty much every rebel ship that he came across single handed. I think that's what all of our kid minds assumed would happen if he cut loose in his special TIE. Don't get me wrong, Vader's TIE had an important role in a New Hope, it just wasn't a very long one. Fans love it all the same, and why not? It was different from the plain vanilla TIE Fighters that were getting blown to bits by guys like Porkins and Pops. It was Darth Vader's ride. You just know that he was back there on the Death Star on weekends changing its space oil and checking the space spark plugs. The Brickpicker price guide shows that Vader's TIE Advanced was selling for up to $738 for a new copy or the most recent high for a used set was $416. When I total the average used price for the parts that make up this ship, I get $598. Unless you already have a fair proportion of the pieces, I couldn't recommend going the route of buying the parts to build your own. I guess if you enjoy the hunt or like the slow process of restoring parts from a myriad of sources to one whole, then go for it, but be aware that with all of the parts orders, you're probably going to be up near new set range. I have heard that you should add about 12% of the parts cost to account for shipping. If you want to see the complete parts list check out Bricklink or Rebrickable.com. The most commonly occurring part in this set is the black Technic, Pin with Friction Ridges Lengthwise WITH Center Slots. Element 2780 is a super common piece, appearing in 1754 different sets. It's so common that for the 56 parts that you need, you're probably going to only spend less than $1.25 all told. We need 32 light bluish grey 1x8 tiles. Element 4162 appears in 153 sets. You're going to get them for about $.21 each. 30 black 1x8 plates are next. This part appears in 516 sets. It's easy enough to find element 3460 for $.04 or less. The dark bluish grey 2x4 plate is found in 557 sets. At $.02, you can grab all 30 element 3020 and not break the bank. There are 29 light bluish grey 1x6 tiles in this set. Bricklink shows a $.13 average for element 6636. It appears in 237 sets. I'm just going to say it now, there's not a lot of color variation in this set. The next part is 29 black 2x8 plates. It's part of 591 sets and element 3034 averages $.08. Averaging $.05 each this set contains 24 Black Hinge Plate 1 x 2 Locking with 1 Finger On End. Element 44301 appears in 103 sets. Also averaging $.05 element 44302 appears in 114 sets. The black Hinge Plate 1 x 2 Locking with 2 Fingers On End is present 24 times in this set. Also requiring 24 is element 2555. The light bluish grey Tile, Modified 1 x 1 with Clip averages $.05 each. It is present in 210 sets. Black 2x6 plates run average of $.06 each. Element 3795 appears 23 times in this set. You'll find this piece in 826 sets. There are 175 sets that contain Light Bluish Gray Plate, Modified 1 x 2 with Door Rail. Element 32028 averages $.07 and this set contains 22. 22 light bluish grey 2x3 plates are a part of this set. They average $.08 each. You'll find element 3021 in 413 sets. At the lower limit of my criteria, light bluish grey plate 1x10 appears 20 times in this set. Element 4477 appears in 119 sets and averages $.17 each. You need to make sure that you have 20 element 4274. Light Bluish Gray Technic, Pin 1/2 averages $.03, but you've probably got a bunch of these hanging around if you bought the 529 sets that it's a part of, since they always include at least one spare. Dark bluish grey 1x2 plates appear in 566 sets. you need 20 element 3023 and I bet you can get them for $.03 or less. The black element 3020 that appears in this set is found in 1194 sets. I see that 2x4 plates are available in quantities equal to or greater than the 20 for this set at $.01 each. I want to break the sticker out of the rare and expensive parts because as a sticker, it has elements that are not a concern for standard parts. Is the sticker applied or is it on the original sheet? Is it wrinkled or flat? This will generally cause a huge shift in values. You have to be careful with stickers. There's a lot of fakes out there and I'm definitely no expert in pointing out the fakes. I'd recommend reading and participating here. Bricklink shows that you can find a sticker attached to the "plaque" assembly for about $40. If you want a new, unused sticker sheet, there's some available for about $90. Looking at the rare/expensive parts, We've only got 10 that meet the criteria that I set forth. These are the parts that appear in 10 or less sets and/or cost more than $1.50 on average. When looking at the expensive parts of a set, we're going to start with the one piece that will make or break your set. Because it is unique to this set, element 2598pb01 qualifies as rare, but the paint decoration on it also contributes to scarcity. A lot of people would probably notice if the lines on their Windscreen 10 x 10 x 4 Canopy Octagonal with TIE Advanced Pattern had a scratch in the paint or trans clear part. It averages $160 used. Element 44357apb03 was a part that I thought for sure could have appeared in another set. Light Bluish Gray Dish 6 x 6 Inverted (Radar) with SW TIE Advanced Hatch Pattern is uniqueto this set though. I believe that since it is a smaller element that is the reason that it can be had for $60 used. The light bluish grey Cockpit 10 x 10 x 4 Octagonal with Axle Hole only appears in this set. Element 2618 can also be found in light grey and dark grey (Dark Grey was in the UCS TIE Interceptor.) In the bluish grey, this piece comes in at about $30. THe primary inventory of this set says that you need 9 element 4095. Light bluish grey Bar 6.6L with Stop Ring (Patio Umbrella Stand.) The inventory also shows that it might have been replaced by element 63965 at some point. A $6 part could be substituted by a shorter $.12 piece. I am not sure why or when this is appropriate to substitute, so be sure you note it if you resell yours. This part appears in 21 sets including 10179 Millennium Falcon which is why such an undistinguished part is so pricy. You need 8 of element 2413. The light bluish grey Wedge, Plate 4 x 9 without Stud Notches appears in 11 sets including 10143 Death Star II. They average about $3 each. Watch out for someone substituting the similar element 14181 which can be found for about $.30. That is an incorrect part and is recognizable for having the notches. The light bluish grey Hose, Rigid 3mm D. 10L / 8.0cm appears in this set alone. You need 8 element 75c10 in this color. They run $2.50 each, watch out for the Dark Grey ones that are about $.30 each. This set also has 2 of the longer element 75c14. The light bluish grey Hose, Rigid 3mm D. 14L / 11.2cm also only appears in this set and also cost about $2.50 each. Again, be careful of the dark grey part which again are about $.30. The dark bluish grey element 3703 appears in 37 sets. You need 2 Technic, Brick 1 x 16 with Holes and they average about $1.60 each, but you'd probably be able to dig a couple up cheaper. The instructions tend to run in the $50-$60 range. Obviously the instructions are available online, but a lot of people like to have them to complete their sets. Right now, there aren't any instructions available on Bricklink or Ebay, so you'll have to keep a lookout if you want them. The box is even harder to find if you need that for your set to feel complete. One has sold on Bricklink in the past 6 months and it was $76.40. There's none available on Bricklink or Ebay at this time. If you want to talk about this great set. talk about it here. Good article . I have onebuilt , it is a very nice display piece ,but very flimsy and delicate . Why is this live? I'm nowhere near done. I believe if a mod posts a comment prior to being live, the status is automatically changed so everyone can see it. 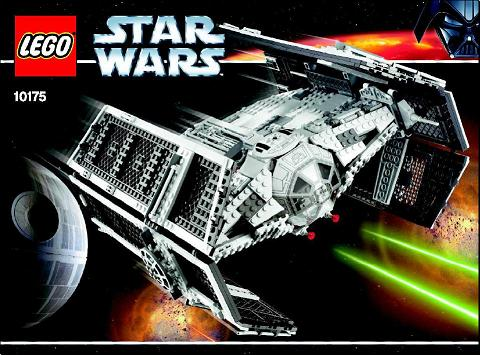 I'm thinking of splitting one of the bigger sets into 2 articles, ucs star destroyer is just too big for one article. Falcon is too. I think I'll look at death star ii next though. Holy cats! I had no idea the Light Bluish Gray Wedge, Plate 8 x 12 (Boat Bow Plate) was $30! Time to sell mine from the mission deep sea quest. Thank you for this!